Animal Health Care Products (AHCP) are used judiciously. All AHCP used in veal calves must meet the strict standards established by the Food and Drug Administration (FDA) for human and food safety. Compared to other food animal production, there are no AHCP including antibiotics approved for use in veal calves for improving growth rate or feed efficiency. They can be used only therapeutically for the treatment of sick animals and only under the supervision of a veterinarian. Furthermore, hormone implants have been strictly prohibited for use in veal calves. Antibiotics are critical tools for preventing, controlling and treating disease in animals. Their proper therapeutic use actually makes our food supply safer. If a veal calf becomes sick, an FDA approved antibiotic can be used as directed by a licensed veterinarian and according to its label for dosage, administration route and withdrawal time. As soon as the animal recovers, the use of any medication is discontinued. Veal production protocols for AHCP usage, that have been in place for years, represent a practical model for the new FDA regulations for the judicious use of antimicrobials in all other food producing animals. To learn more about the new animal feed safety regulations and the use of antibiotics to protect public health, visit the Animal Health Institute. All veal calves must be ambulatory and pass inspection when presented for slaughter. The veal industry has an ethical obligation to ensure only healthy animals are delivered to processing or packing plants. Current regulations appropriately stipulate that only healthy animals able to walk can be slaughtered. A primary function of the agency’s inspection duty is to determine whether livestock are fit for slaughter. Once calves leave the farm, they are inspected by either a federal or state agency throughout each step of the production process to ensure food safety. All state and federal meat inspection is overseen by the United States Department of Agriculture's (USDA) Food Safety Inspection Service (FSIS), which regulates food safety standards for raw meat. 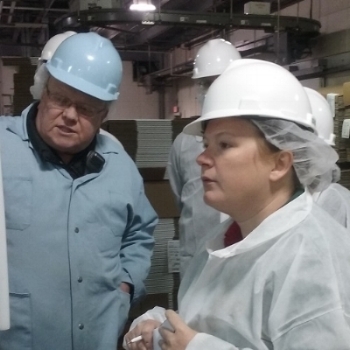 FSIS inspectors work within meat processing and packing plants to ensure compliance. Only raw meat that meets FSIS standards for safety, wholesomeness and labeling is given a USDA seal. Veal calves are inspected twice before processing by the USDA. Federally-inspected meat plants are subject to the Humane Slaughter Act, which is enforced by USDA inspectors who are in meat packing plants during every minute of operation. If tests produce any questionable results, then the meat never reaches the food supply. The USDA Food Safety and Inspection Service (FSIS) requires meat packing plants to adopt the Hazard Analysis and Critical Control Point (HACCP) system. HACCP is designed to protect food safety by addressing problems through proactive practices that identify and limit potential food safety impacts. Veal farmers, like other livestock producers, are responsible under the packer’s HACCP plans to supply healthy animals that are free from residues or any other issues.